Ni Zhen. 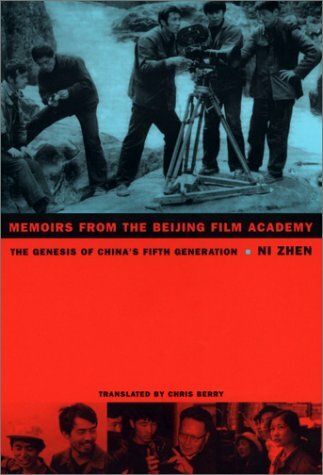 Memoirs from the Beijing Film Academy: The Genesis of China’s Fifth Generation. Tr. Chris Berry. Durham: Duke University Press, 2002. pp. 256. ISBN 0-8223-2956-5 (Cloth); ISBN 0-8223-2970-0 (pbk). In the mid -1980s, a new term came out of China that brought fresh life to the Chinese film industry — the Fifth Generation. The term was used to describe a group of filmmakers who graduated from the Beijing Film Academy in 1982 and broke the socialist realist mold by introducing a new cinematic form, style, and narrative approach. Through bold films like One and Eight (1983), Yellow Earth (1984), and On the Hunting Ground (1985), audiences were finally given a visual reprieve from the tired tropes that had dominated the cinematic landscape in China for more than thirty years. The key names in this new film revolution–which included such directors as Chen Kaige, Tian Zhuangzhuang, Zhang Yimou, Li Shaohong, and Wu Ziniu–quickly became known throughout China and their collective moniker, the Fifth Generation, became something of a legend. Over the course of the next twenty-five years, the Fifth Generation has indeed gone on to define and redefine Chinese film culture in the postsocialist era. While the collective spirit of collaboration that dominated early productions has long abated, the trajectories of the key Fifth Generation creative forces has continued to dominate the majority of the cinematic trends in contemporary China. From modern historical epics ( Farewell My Concubine, To Live, The Blue Kite ) to contemporary urban dramas ( Together, Happy Times, Baober in Love ) and from a classical obsession with the First Emperor ( The Emperor’s Shadow, Emperor and the Assassin, Hero ) to a new obsession with epic transnational martial arts fantasy films ( House of Flying Daggers, The Promise ), the Fifth Generation continues to leave an indelible imprint on the development of Chinese cinematic trends. Even the rise of so-called “underground” or independent filmmaking so often associated with the not-unproblematic term “Sixth Generation,” benefited from the support and sponsorship of Tian Zhuangzhuang, who became a godfather of sorts to the movement in the late 1990s. Ni Zhen’s wonderful Memoirs from the Beijing Film Academy largely shies away from the glorious commercial triumphs, heated political controversies, and frenzied media attention that have surrounded the Fifth Generation over the course of the past two decades. Those pages of the Fifth Generation’s story have been written about elsewhere. What Ni Zhen has attempted is a historical narrative of the formation of the Fifth Generation during their time at the famed Beijing Film Academy, China’s most prestigious training ground for cinema talent. This formation story is divided into four chapters that trace the aspiring filmmakers struggle to be admitted to the Academy to their early cinematic contributions soon after their 1982 graduation. By focusing on the Fifth Generation’s “pre-history,” Ni Zhen is able to provide a powerful, insightful, and moving snapshot of the personalities of some of China’s most important filmmakers and the largely undocumented struggles it took for them to achieve their cinematic dreams. One of the reasons the Fifth Generation stood out so dramatically from earlier groups of Chinese filmmakers is intricately connected with their unique historical experience. The majority of the Fifth Generation filmmakers belong to a group sometimes referred to as the lao san jie , or the “three old classes” (graduating from middle school in 1966, 1967, and 1968). They are the generation that were born around the time of the founding of the People’s Republic of China (in 1949) and grew up with the young nation, coming of age during the mid-1960s, just in time for the unleashing of Mao’s Cultural Revolution. Their education was interrupted as they bore the armbands of the Red Guards before being sent down to the countryside for reeducation (in 1968). Ni Zhen highlights the importance of this unique background shared by so many Fifth Generation filmmakers, especially their experience as Educated Youth during the Cultural Revolution’s Rustification Movement. The impact of the Educated Youth experience can clearly be seen in works such as Chen Kaige’s King of the Children (1987), but even earlier works like Chen’s Yellow Earth can be read as a means of revisiting the traumatic Educated Youth experience. In the case ofYellow Earth , the PLA soldier’s journey to the barren countryside where he is ultimately “reeducated” by the land and the people is often interpreted as a doubling for the Educated Youth experience decades later. Ni’s penetrating description of how being “sent down” shaped this group of filmmakers is richly recounted during descriptions of the admissions process and how it was then rearticulated through their later student films. As the title implies, Memoirs from the Beijing Film Academy offers a portrait not only of the individual Fifth Generation filmmakers’ formative years, but also the school that helped produce them. Just as the incoming students were emerging from a decade of intensive labor in the countryside, so too was the school itself emerging from a long period without having produced a single graduating class. As Ni Zhen describes the Fifth Generation’s struggles, he also candidly reveals the Academy’s own struggles to update their curriculum and deal with such issues as age restrictions on incoming students. Through such descriptions, readers are also privy to the inner workings of this important school during this period of radical historical change as the Beijing Film Academy–and all of China–made the transition from the chaos of the Cultural Revolution into Deng Xiaoping’s Reform Era. Ni Zhen is careful not to introduce the Fifth Generation’s contributions in a bubble, but to firmly root them within the dynamic matrix of change occurring in poetry, painting, and literature. From the impact of Luo Zhongli’s painting Father (1980) on Yellow Earth ‘s characterization of peasant figures to the influence of Bei Dao and the other Misty Poets on the abstract cinematic language of the student filmmakers, Ni Zhen draws rich interconnections between different artistic realms. Ni pays particular attention to fiction: the impact of writers such as Wang Meng and Wang Shuo on the Fifth Generation and the process of adapting stories by Shi Tiesheng, Wang Anyi and Ah Cheng for film. It is against this rich social and cultural backdrop that Memoirs from the Beijing Film Academy captures the fascinating transformation of an entire generation of young aspiring filmmakers into some of the most visionary cinematic pioneers in Chinese film history. Beginning with the students’ acting workshops in the spoken dramas of Cao Yu and Lao She to their analysis of montage through Soviet classics likeMother (1926) and Battleship Potemkin (1926), Ni traces the Fifth Generation’s training, which culminates in their own student films. The discussion of early student films such as Our Corner (1980), The Yard (1980), and Red Elephant (1982), are especially revealing. These are films that have been rarely seen outside China, and in the case of the first two titles are largely unknown outside the gates of the Beijing Film Academy. Their importance in defining the early artistic direction of the Fifth Generation, however, cannot be underestimated. Ni Zhen not only provides detailed plot descriptions of these early landmark works, but also offers fascinating behind-the-scenes glimpses at how these films came to be made. In the case of Our Corner, the topic of film censorship is also broached, a hurdle that would unfortunately reappear to challenge many of the directors later in their careers. While the central characters of Memoirs from the Beijing Film Academy are clearly the trio of directors who, for many, have become the face of Chinese cinema–Zhang Yimou, Chen Kaige, and Tian Zhuangzhuang–Ni Zhen is careful also pay considerable attention to other directors such as Wu Ziniu, Li Shaohong, Peng Xiaolian, and Xia Gang, as well as to a wide array of cinematographers, actors, art designers, and sound designers who also played a key role in this cinematic movement. The role of cinematographers Gu Changwei, Lu Yue, and Hou Yong and art designer He Qun, all of whom went on to become directors in their own right, is given considerable attention. There are also other historical figures who appear in the book, including the professor and famed cinematographer Wu Yinxian and the veteran director Guo Baochang, who while known today for his blockbuster television miniseries Gate of the Reign (2001), appears in Ni’s narrative as a key patron of the Fifth Generation’s daring vision at Guangxi Film Studio during the making of One and Eight . Especially interesting is Ni Zhen’s account of Zhang Yimou’s rise from relative obscurity from behind the shadows of Chen Kaige and Tian Zhuangzhuang, both of whom were generally acknowledged to have the most potential for bringing about a true cinematic revolution. Through such discussions, the author reveals the factors at work behind the eventual emergence of Zhang Yimou as the face synonymous with Chinese cinema since the late 1980s. Perhaps the most fascinating section of the book comes in Chapter Four: Graduation, where Ni Zhen details the complex process of job allocation after graduation and the startling results of a small group of talented graduates being sent to a provincial film studio in Guangxi province. Although most of the graduates petitioned to stay in Beijing, those who did stay behind found their opportunities extremely limited. Studios like the Beijing and Changchun Film Studios were crowded with veteran film directors and young graduates had little opportunity to exercise their talents except in subordinate and assistant positions. In the end, it was the assignment of the art designer He Qun, the director Zhang Junzhao, and the cinematographers Zhang Yimou and Xiao Feng to Guangxi Film Studio that unexpectedly opened up a new space for these young filmmakers to exercise true creative control of their own cinematic vision. Ni Zhen’s detailed description of the origins and making of One and Eight , one of the landmark films of the New Era, traces the unique forces that came together to create this early Fifth Generation masterpiece. The subsequent discussion of Chen Kaige’s Yellow Earth is another important section that will serve as an excellent supplement to Bonnie McDougall’s full-length study of the film. Collectively, Ni Zhen’s penetrating description of the production details behind One and Eight and Yellow Earth not only round out the formation stories of these artists but also provides an important historical testament to two of the most important films of the New Era. The narrative strategy employed by Ni Zhen in Memoirs from the Beijing Film Academy falls somewhere between academic writing and a more popular style. Throughout the book, he drifts back and forth between a sweeping narrative voice that traces the radical cultural changes transpiring in China between the years 1978-1982 and a more informal tone that relays anecdotal tales of academy auditions and early student film projects. It is to Ni’s credit that he is able to comfortably meld these two narrative registers without alienating his reader. The awkward register of these passages are no fault of the translator, Chris Berry, but representative of a prose style that, while quite common in Chinese, is not generally accepted in English. In terms of content, Ni Zhen’s main aim seems to be accessibility. In his “Preface to the English Edition,” he explains that the book’s impetus came with an invitation from Kimata Junji and Seki Masami to produce a Japanese book that introduced “the early days of the Fifth generation” (xiii). To this extent, Ni has succeeded, producing a book that is highly readable and an excellent introduction to the early years of the Fifth Generation. Memoirs from the Beijing Film Academy will be a most welcome addition to college reading lists on Chinese cinema. There is almost no one better situated to document this rich pre-history of the Fifth Generation than Ni Zhen. He was a Professor at the Beijing Film Academy for twenty years from 1980 to 2000 and is the author of numerous articles and important book length studies on Chinese film, including Reform and Chinese Cinema (1994). During his tenure at the Beijing Film Academy, he personally taught most of the filmmakers discussed in his book, many of whom he established life-long friendships with. In addition, with the rise of the Fifth Generation on the international film scene in the mid-1980s, Ni Zhen became one of their chief collaborators, penning screenplays for Zhang Yimou (Raise the Red Lantern ) and Li Shaohong ( Blush ). It is this three-pronged relationship of mentor-friend-collaborator that Ni Zhen is able to draw upon to build this rich narrative of the Fifth Generation’s formation. Similarly, Ni Zhen (and the reader) could not be in better hands than those of Chris Berry as the translator of this important testament to the rise of the Fifth Generation. Beginning with Perspectives on Chinese Cinema (1991), Berry established himself as one of the premier overseas scholars of Chinese film. Besides his work as a film scholar, Berry also has extensive translation experience, having subtitled numerous Chinese films and translated Ding Xiaoqi’s Maidenhome (1995), which makes him the ideal person to introduce Ni’s book. In addition, Berry was one of the few Western film scholars to have actually worked in China during one of the most important periods in the Fifth Generation’s early development. Berry’s time in Beijing as English-language consultant for the periodical China Screen spans 1985-1988, beginning just where Ni Zhen’s narrative leaves off. As a “pre-history” of the Fifth Generation, readers may wonder where to go afterMemoirs From the Beijing Film Academy for the next page in the story. 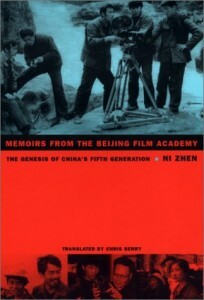 The sequel to Ni Zhen’s work and the amazing tale of the Fifth Generation continues to be written; Chris Berry himself has already contributed several important chapters in that history in his important monographs, Postsocialist Cinema in Post-Mao China (2004) and China on Screen: Cinma and Nation (2005). Memoirs From the Beijing Film Academy is a story about a school, a cinematic collective, and a group of artists living in a new historical era where suddenly anything seemed possible. The rise of the Fifth Generation signaled a fundamental change in Chinese cinematic history and, through the power of the moving image, helped further transform a society already in transition; Ni Zhen has provided an insightful testament to that transformation that will ultimately redefine our own understanding of one of the greatest movements in Chinese film history. English language sources that focus primarily on the Fifth Generation and their films include Jerome Silbergeld’s China Into Film: Frames of Reference in Contemporary Chinese Cinema (London: Reaktion Books, 1999) and Paul Clark’s Reinventing China: A Generation and Its Films (Hong Kong: The Chinese University Press, 2005). The most famous case, which Ni Zhen discusses in detail, deals with Zhang Yimou. Zhang was 28 at the time of his application, far exceeding the age limit; it was only on the basis of his outstanding portfolio of photographs and directive from above that he was finally admitted. Li Shaohong was another difficult case for the admissions committee because at 16, she was deemed too young for admission by some faculty. See Bonnie McDougall. The Yellow Earth: A Film by Chen Kaige with a Complete Translation of the Filmscript . (Hong Kong: Chinese University Press, 1991).